Behind the Bit: Bob meets the Hen-Man, I get signed t-shirt! Bob meets the Hen-Man, I get signed t-shirt! Bob got to meet Henny Sunday morning prior to Show Jumping. We'd rubbed elbows with Peter in the "sponsor village" area on Friday, and Sunday morning Peter called a Meet-and-Greet at the inspection area. 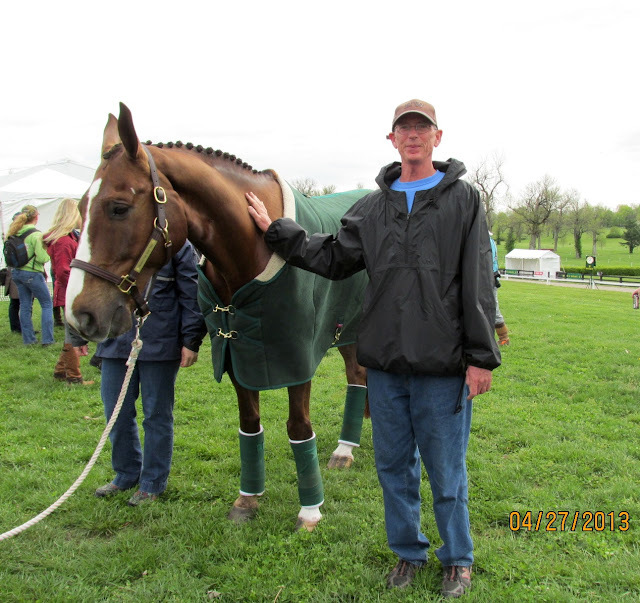 While the Rolex riders all seem to be generally approachable and friendly (I saw lots of people chatting with various competitors throughout our time at Rolex), Peter seems very attentive to his fan base. He is about as down-to-earth as they come and spoke of his relief at having passed the inspection earlier in the morning. Bob got a photo, I got a signed T-shirt. Henny was not quite as fan-focused. The photo sessions were interfering with his agenda for the morning -- grazing. Neither of us wanted the groom to wrestle his head up for the photo, so we kind of took what we got. What a beautiful horse this is -- big ears and a kind eye, what more can you want? This was such a wonderful day. Peter and Henny placed tenth with a textbook round in show jumping. I didn't want to blog this, but while Peter was warming up for his dressage test, his trainer said, more than once, "keep your hands quiet." This tickled me, I guess it's advice that is given up through all the levels. To be fair -- Wonderful as Henny is, I don't know that he is a smooth ride.